When supply chain professionals ask the question: “ What are the practical benefits of independent mobile robotics?” they expect to hear the answer “They deliver substantial cost savings.” But the full answer is that adding next-generation robotics to your warehouse also impacts your revenue, competitiveness and growth. In addition to lowering labor expenses and mitigating resource constraints, robots speed up and improve order fulfillment functions in uniquely scalable ways that drive a transformation in cost structure and productivity for accelerating business growth. The most-cited “go to” benefit by users of distribution center robotics. Labor expense reduction drives ROIs that can be measured in months, not years. Multishift and peak execution approach “first shift” productivity due to the simplification of the picker’s task and general streamlining of the human processes. Independent mobile robotic solutions let pickers pick while the robots do everything else. Early cases show up to 100% increase in labor productivity. One of the most understated benefits of robotic enabled picking and replenishment. 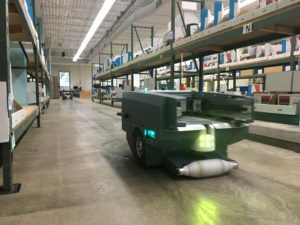 Without the need for expensive smart conveyors and major infrastructure investments, independent mobile robotic solutions allow manual DCs to be enabled with few infrastructure modifications. The robots and pickers can work side by side, which allows existing DCs to be quickly and easily retrofitted with no disruption in daily output. Automation can be added in small steps and phased to match growth in demand. This produces higher order fulfillment rates per hour from the existing facility. The DC can keep fulfilling the core business as the adoption is added. This is simply not possible with smart conveyor or other fixed automation conversions. Traditional methods of expanding picking capacity entail major infrastructure cost. Costs may be incurred for additional DC locations, building expansion, adding conveyor systems, AS/RS systems, new picking mezzanines, and much more. Independent mobile robotics solutions require significantly less capital cost. In many cases picking to discrete orders eliminates expensive secondary sortation and removes constraints imposed by manual picking and packing activities. Leveraging the robotic workflow produces a rapid-payback, low-capital solution. What if you could deploy fewer, better trained workers instead of an army of temps? Non-first-shift activities chronically suffer from lower productivity, staffing difficulties, and high turnover. Independent mobile robotic workflows can ramp up for the peak season with less additional labor, and bring even new workers up to speed more quickly. The streamlined process delivers a two-fold benefit: lower training time/skills requirements plus increased execution excellence. Both the day shift and the off-shift are made more efficient because as the day shift becomes more productive, off-shift requirements go down. Higher picker productivity enables shorter shifts. The work is done with fewer resources, more efficiently in less total time. Customers buy more when they get what they want when they want it, at the cost they want to pay. Adopting a next generation robotic workflow impacts revenue and growth directly by supporting higher levels of demand with speedier click-to-door fulfillment and lower costs. Over the past 5 years delivery expectations have collapsed from 6 days to 1 day (or less). Failing to deliver on those customer expectations consistently results in lost market share and brand damage. The agile robotic workflow provides more flexibility for market capture/demand shaping activities like flash sales and promotions. By reducing touches, shrinkage and the human mistake rates that are inherent to manual systems, higher peak demand can be met with high process quality, resulting in fewer unhappy customers and returns. Next generation mobile robotic workflows enable you to execute faster while holding margin and quality. The benefits of adopting a next generation robotic workflow for picking and replenishment are real and quantifiable. With these benefits the use of robotics in the warehouse is inevitable. The onus is on supply chain professionals to get in front of this shift before they are left behind.